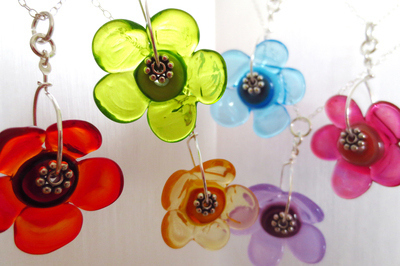 Beautiful Lampworked flower pendants. Available in 6 colours. Finished with Sterling Silver details comes on an 18inch Sterling Silver chain. Flowers are all individually hand made and so will vary from the picture. Middles of the flower colours may vary. Size of flower head is approximately the size of 50p piece. All jewellery comes in a gift box. Please note this item is made to order, please allow one week for making.